YuppTV Blog: YuppTV named ‘Company of the Year for Innovation and Leadership’at the IAIR Awards 2016! YuppTV named ‘Company of the Year for Innovation and Leadership’at the IAIR Awards 2016! Atlanta, March 30, 2016: YuppTV, the world’s largest Over-The-Top (OTT) provider for South Asian content, has added another award to its growing list of accolades. 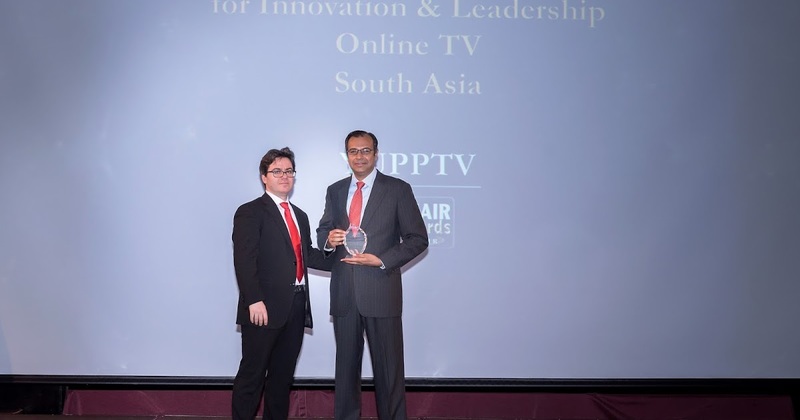 YuppTV was named the ‘Company of the Year for Innovation and Leadership the recently concluded IAIR Awards 2016 in Hong Kong, winning the vaunted title in the Online TV – South Asia segment. The award was received by Mr. Sudhir Pakala – Director, Corporate Development of YuppTV on the behalf of company. IAIR AWARDS® is one of the world's leading ranking and prize for excellence in global economy and sustainability. It is made up of the scientific committee of IAIR® and IAIREVIEW.org along with a team of dedicated legal, economic and financial journalists in over 120 countries worldwide.YuppTV’s win at the event underlines its sustainable business practices and scalable business model, as well as its brand proposition as an industry leader in the OTT video content segment in terms of developing a more innovative approach. YuppTV is amongst the most popular mobile TV apps in the world, and has more than 2 million app downloads on Samsung TVs worldwide. It is the 2ndmost downloaded App among Android TV Apps in India, and has more than 5 million monthly visitors on its platform.